I adore classic decor. I like the word “classic” so much better for decor than”traditional”. Traditional has a dowdy ring to it! I strive to keep my decor on the classic side, but I certainly don’t want it to look staid or stale. Sometimes these styles can get stuck in decades past. Not in my house! And you should say the same thing too. If you love classic decor like I do here are 10 ways to kick classic up a notch and make it look very updated and chic! Add something personalized. Like a pillow, tray, acrylic box or chair back. Monograms are classic and sassy and they up the wow factor in any classic home! This little lumbar pillow is still a classic with its striped material and iconic monogram. But it is an attention grabber on my sofa! To keep traditional decor from getting too serious infuse a little fun, whimsy or a modern element to a room. One great fun piece will totally change the room! This fun chair was purchased for an upstairs bedroom but when we unpacked it in the foyer I knew it would never make it upstairs. It really added a fun casual look to my formal living room! Who knew!!! Don’t get too symmetrical. Try offsetting something in your room! Or add a little rustic to your refined. The idea is to have something that looks just a little surprising, a little askew… a juxtaposition. Now that adds interest! I added a very rustic stool made from burlap and a crate to my classic spindle chairs. A great contrast of looks! Today’s curtains are sleek and not fussy at all. They don’t drip with trim or yards of fabric. Go for a classic fabric and pattern but keep them very simple. I go back and forth about changing out these curtains. They are simple and I love the pattern and fabric but maybe another fabric would make the room even more updated! What do you think? Don’t discount the value of a rug!!!! They can often make a room. Try adding a non-traditional rug to a traditional room and see what happens! Instant update! Try sisal, animal skins, acid washed orientals. All great choices to work with classic decor! 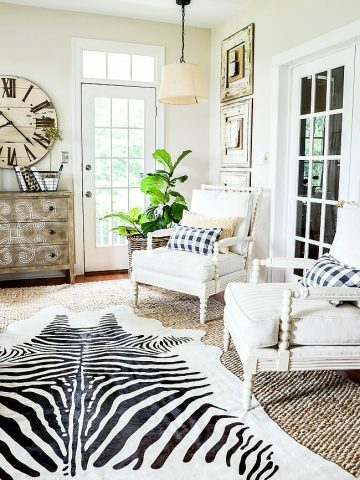 I know my zebra rug may not be everyone’s pick but for me it makes my heart flutter every time I walk in the room! Find what makes your heart flutter and add it to your classic furnishings! Replace lots of tiny accents with just a few bigger ones. Look for big lanterns, galvanized metal objects, great faux plants and anything that is trendy and works with your room. Bigger and fewer is better! On the Curlacue (yes, that’s how the manufacturer spells it) chest I opted for a huge lantern with a crumbly candlestick and candle inside. I gathered up a couple burlap covered books and a plant in a wire basket. Voila, updated classic! All reasonably priced with lots of texture and interest. I can’t stress enough how much wall paint will make a difference in the look of a room. Take down any wallpaper over five years old or repaint if you have not done it in awhile. The trend right now is lighter walls. Find a color that works with your furnishings! These walls used to be a butter yellow and I loved them! When I was ready for an updated color I chose a soft bone called Sonnet by Benjamin Moore. Best decor decision I have made in this house hands down! Art is such a subjective thing. I say if you love it… leave it! But if you are ready for an updated look try hanging architectural pieces, a big clock, or some funky, conversation provoking art! I’ve had this painting by a local DC artist, Daniel Kessler for a few years. It’s certainly not traditional and has a modern folk art feel. And one of the most asked questions on my blog is about this giclee. It was actually the inspiration for the update of the living room. I have other pieces of his art like his funky red dog, a large baseball and his crayon box colored cats. I love this art! And it gets lots of comments! I want his funny bunny next! Okay, you knew I had to talk about pillows. Whenever a change is needed think… PILLOWS! They are inexpensive and FABULOUS! I think pillows are the quickest way to update a classic look. Gone are the days of excessive trim and heavy pillows. Think light, fun, and lots of them! 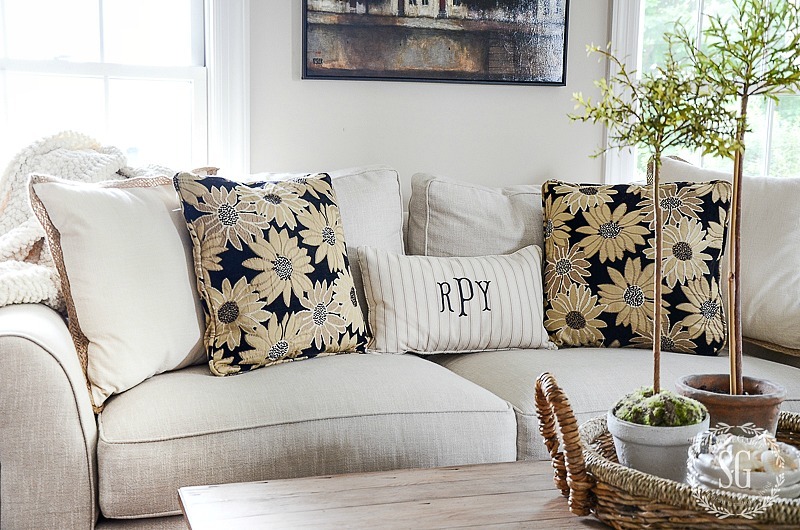 The black and white embroidered stylized flower pillows are not new but they are such great pillows to kick up my classic living room furnishings. Did you notice that they are sandwiched in between two more neutral pillows? Not a mistake! Keeping them a little less noticeable keeps them from overpowering the room. I love the pattern and colors but did not want them to be the star on my sofa! Nothing says dated like furnishings that are too matchy-matchy! Or a “suit” (or suite) of anything. But don’t get rid of them. Separate them! If you have all golden oak case pieces paint one, use one and replace one with something that works with the others. It’s really not hard. Same with that cherry or mahogany dining room furniture. You might keep the table, paint the chairs and replace the hutch with open shelves or a long cement topped buffet. That is just what I did and it worked for several years. Recently I replace the table too. Only one of the fabrics in my living room has matching fabric. It’s on the spindle chairs! But all the fabrics and patterns work together. The key? 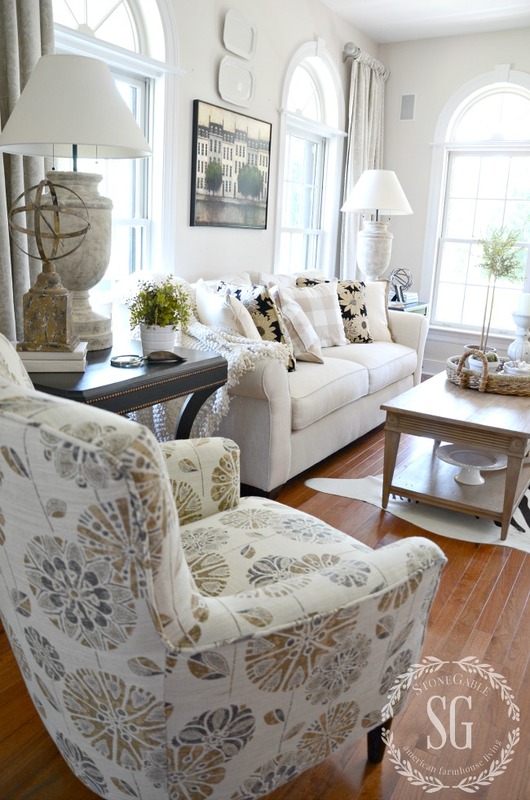 Neutrals, lots of texture and patterns that play nicely together! And don’t forget something fun! 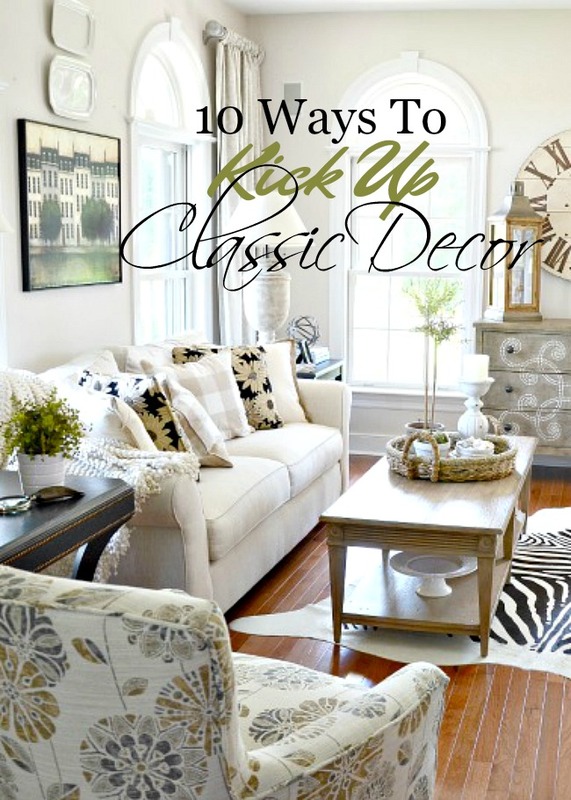 Those are my top 10 ways to kick up traditional or classic furnishings!!!! What’s one way you like to update a classic look? Please share. Today on Decorating Tips and Tricks we are talking about fabulous ways to PARTY OUTSIDE! So join us on the patio, lawn or porch and let’s start the party!!!!! Today we are taking our party outside! Listen to HOW TO ENTERTAIN OUTSIDE. We have tons of great ideas! 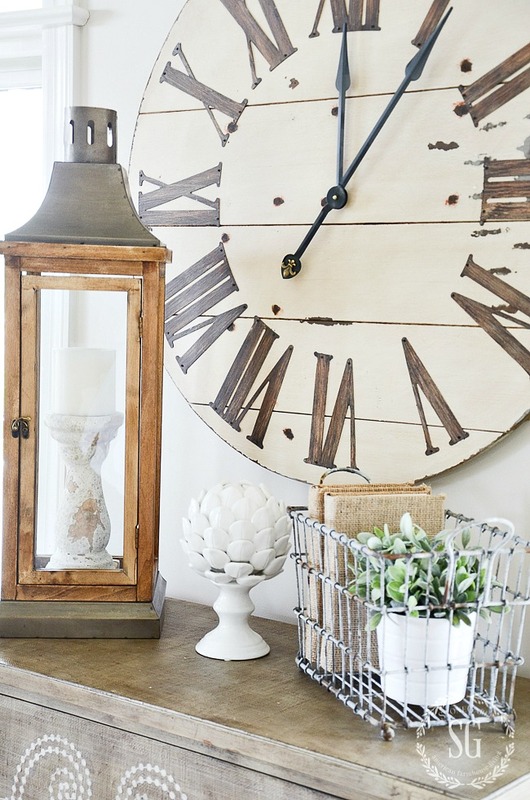 Thank you for these easy-to-understand tips on updating our homes! I have recently been buying vintage and used furniture from craigslist, as I have long had almost empty rooms but limited funds. So by necessity, I am having to mix old and new(er) items, which can make it challenging but also so much fun! Luckily I really prefer a mainly classic but also collected and varied look. Your ideas and lessons are so helpful. Thanks for the tips to kick up a living room. All great suggestions!! I love this room. 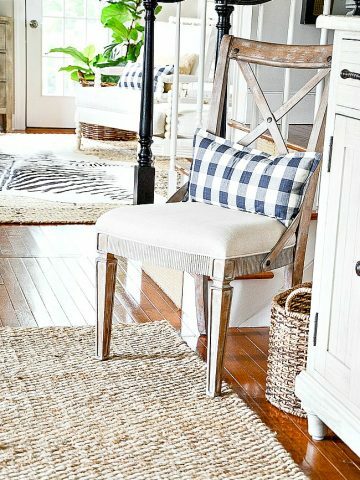 I’m a new reader – never been one for decor blogs, but I just bought a new house and am looking for inspiration and I love your posts. So helpful! I look forward to your emails every day. 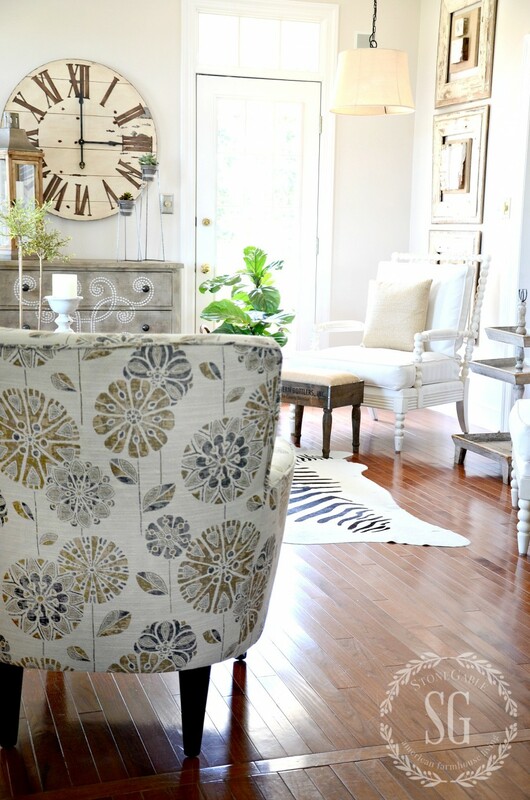 My question – the accent chair. I love that material. Do you have a link for it? Thank you! Thanks so much Linda! Keep on spreading the word! Hugs to you! I love your decoration, congrats! I Love ❤️ Love ❤️ Love what you did in the living room… I can see why you have so many visitors.. I’m sure they can’t wait to see what your going to do next!! Do you sell the flowered throw pillows? I enjoy your post!! I love things monochromatic with a touch or a pop of color.. Your room is very inviting and you just want to go in and sit down enjoy a glass of wine in the company that you share… love ❤️ all that you do..
Karen, I am starting next week to sell great items like pillows! Look for the ones you are asking about in early fall. Wow! That is so great. Please include APO addresses and ship USPS to military families serving overseas. I read this from Cairo and since part of our job is entertaining I so appreciate all the great ideas. What can I say except thank you..I now know exactly what I need to do, It was the mixy matchy business that was my downfall, yes separate and paint…It was an UH HAH moment for me, your explanation just made it fall into place. I have taken notes and have my trustee lil book with me always, so when I see’ THAT PIECE’ I wont wonder should I or not…Thanks again and look forward to your next post. Hi Yvonne, I love this post and have bookmarked it! 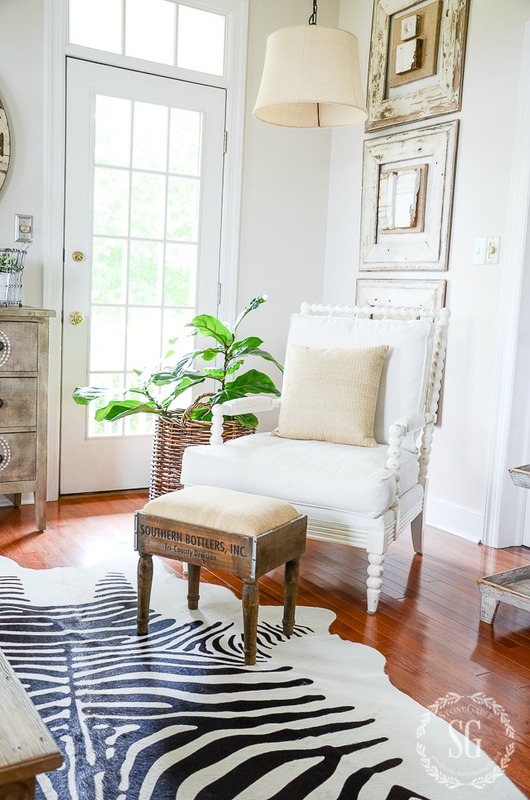 The splash of whimsy in the chair and black and white accents work so well together. Only you can pull off mixing these together. I have admired your draperies in the past few posts and love how you hung them just to the side of your gorgeous windows, allowing light to come through & the windows are not covered up. I have not hung any draperies in my house because I have plantation shutters, but I you have given me another idea. Thanks again for sharing your ideas…look forward to many more. Leave the curtains. They are essential for the wide wall. Besides they balance the opening into the room and balance the french doors and other decor on the opposite wall. You have excellent taste. STAY WITH IT. Hi Yvonne, you have such gorgeous trim around your windows – do you really need drapery? Hard to tell from a picture versus standing in the room and taking it all in…. I follow many design bloggers as we share this idea of loving your home and making it the best it can be. However, your style and suggestions really hit a home run ! Thanks for all the info you share ? Where did you get the accent chair. I love everything about this! Listen to your podcasts….lots of great ideas. Won’t be second guessing myself about recorating after seeing this! Love your kicked up classic decor!! Love everything about this room!! have been looking for a coffee table like yours. Where did you purchase it? Finding the perfect end tables and coffee tables seems difficult for me. Yours are perfect. Love the shelves on the bottom, more space for books and decor! Also love the height of the end tables. Hi Jan! I found my coffee table at Ethan Allen a few years ago. Thanks so much for your very nice comment! I love the word Classic and agree Traditional sounds so dated!! How beautiful and fresh this room looks, I love it!! I love your blog … for interior ideas and touching hearts!! Thank you for sharing Jesus!! You asked about your curtains … they look lovely! I was wondering about mine too!! I still have a floral print in my LR and DR. Is solid color a better look for now? I use blue, white and butter yellow. Thanks for your thoughts! That picture is the number one thing in your house that says, “you”, that is, in my mind. Besides pillows, that art piece definitely tells me it’s you. When I first started following you, I fell in love with your style and your green and black color way. I hope you never change, or at least not stray too far, and if you do, I want to be first in line for the art piece. Ha! I love that chair. Perfect colors. Thank for the tips. I definitely need to edit some of my accessories. 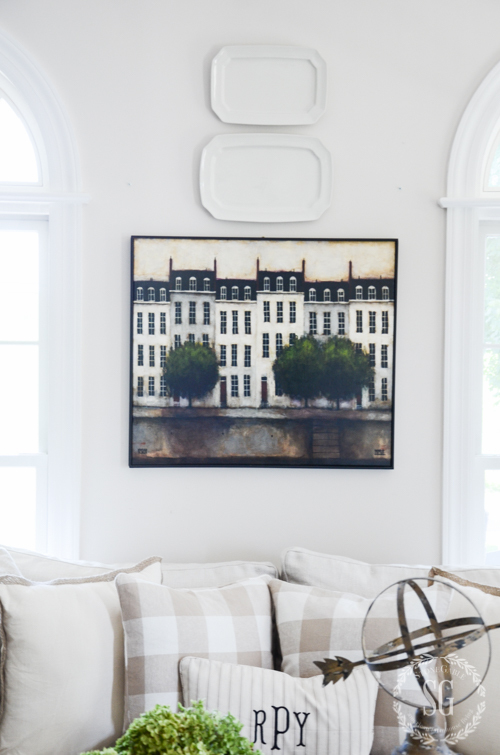 Love your wall art, too! I saved this back to read! I’m glad I did. I have some rearranging to do on my coffee table, my “stuff” at my fireplace, and my kitchen table needs refreshing. Is it because the hot days of summer have my flowers and roses at a standstill?!! A year of mourning? I don’t know. But your posts do not point out my lacks of what I’ve done but encourages me to keep looking forward in the home I’m in. Keep updating. Keep doing what I can with what I can. You keep me from growing “limp” like a wet noodle!!! Thank you for these kind of posts too!! Love your classic design! Your home is so beautiful. You have inspired me to no longer call my home traditional but go with the description of classic style. I was hoping to see some fireplace mantle ideas…love your room. My following question is, would you be willing to tell me the name of he zebra rug you bought off of overstock? I am currently in the market for one and am having a VERY difficult time telling which hide rug is of good quality. I don’t want to end up with a cheap looking rug! Your home is so beautiful, and I wouldn’t change a thing! Love, Love, Love all of your ideas and style! Keeps my mind agile thinking about all the possibilities. LOVE that stool — was that a creation or a purchase? Where to find, please. Oh my goodness! I wouldn’t change a thing about this room. I love everything about it. Your blog is the inspiration for my entire home! Thank you! I love the word classic when describing decor; traditional sounds too old and formal. Great style tips! I love the monogrammed pillow! These are great tips for keeping things fresh! I’ve always been a classic girl too. There is just something warm and inviting to me in a classically decorated room. I love that your suggestions to refresh are inexpensive and easy. That’s always a win! I vote keeping your curtains, but if you are having the urge for a change, why not get something for the fall and winter and change it back to these next spring? I’d still keep them neutral, but possibly a bit darker for those cooler seasons. I always enjoy all of your beautiful and helpful suggestions. I also love the classic decor look. ? I agreed with other ladies your living room is my favorite room! Love your living room. You always inspire me. Where can I get the clock! I love it! Try Ballard Designs. I got mine there. I, personally, would take the curtains down. The curtains are a distraction, especially being spaced so far apart. The windows are beautiful on their own. Thank you Yvonne for your simple but oh so effective updates for a living room. That is why I love using neutrals ,they are so season friendly. Cool in the summer and warm in the winter all with some easy changes. Thanks for all the wonderful helpful tidbits!! You always give me something to think about! I enjoy that! Great advice! I agree with it all. 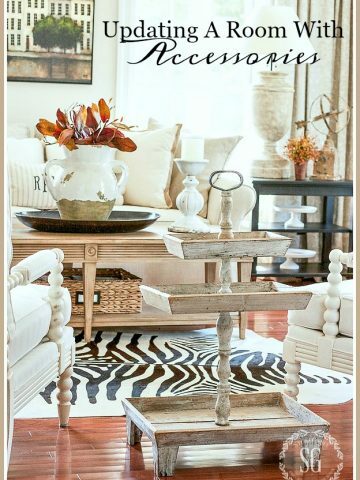 Love the zebra rug~that says StoneGable to me! The curtains look awesome. I like to add something monogrammed as well, I think it adds a touch of class. A little black adds drama. Greenery adds life & mirrors add light. When I’m in the mood for an update sometimes I just rearrange things…sometimes it’s furniture sometimes just small touches. Wonderful tips and I love the room! Lovely room so light and airy. Yvonne, I love your draperies. If you take them down, I’m interested to purchase them! You have influenced my thinking in a big way to the point that I’m ready to go with a neutral palette with some accents for our classic living area. I appreciate your blog. It is by far my favorite! It seems as though everyone loves the curtains as they are, but I’m not a fan. They are okay, but just okay. Since they do not hang in front of a window, and are not affected by light shining through them, you could use any color chosen from your accents and accessories to tie them to something a little more colorful in your room. I would try a somewhat beige-gold, picking up what is in your floral chair and your beige pillow and the numerals on your clock and the old gold patina on your accessories. The thing with draperies is that they are easily changed when the mood suits you, especially if you can sew them yourself. Just an idea since you did ask. I think your home is wonderful. 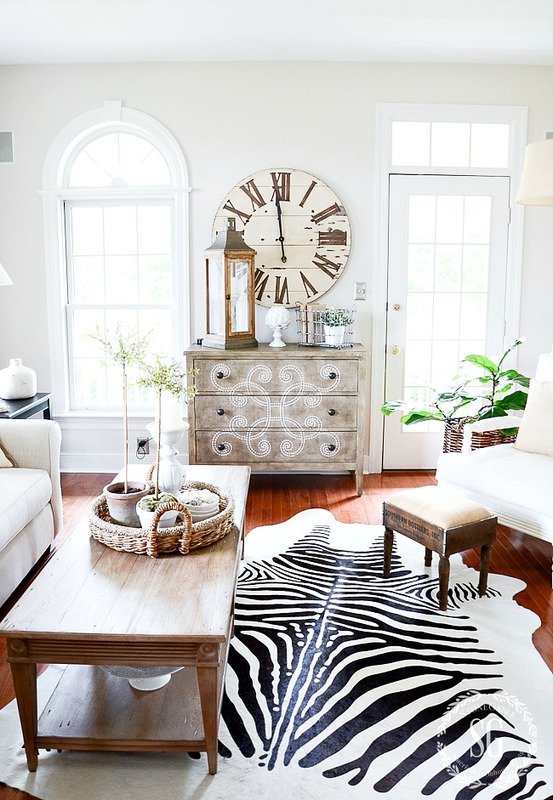 I love the Zebra rug and maybe copying that idea. Love your style and blog! Great tips. First of all I love that zebra rug! I’m trying to get my husband convinced that I need to paint my hutch in my dining room because it would really lighten up the room. I’m still working on it! Great tips as always. I love everything about this room – the neutral colors without being boring, the texture, the layers. Love! Love love LOVE the chair Yvonne! Gives the room something extra special! GREAT. information – you are one classy lady. BTW you have the cutest granddaughter ever. Her hair is amazing! Great Tips! but I need more!! We just bought a new to us house and I would consider the architecture both in and out “classic”. 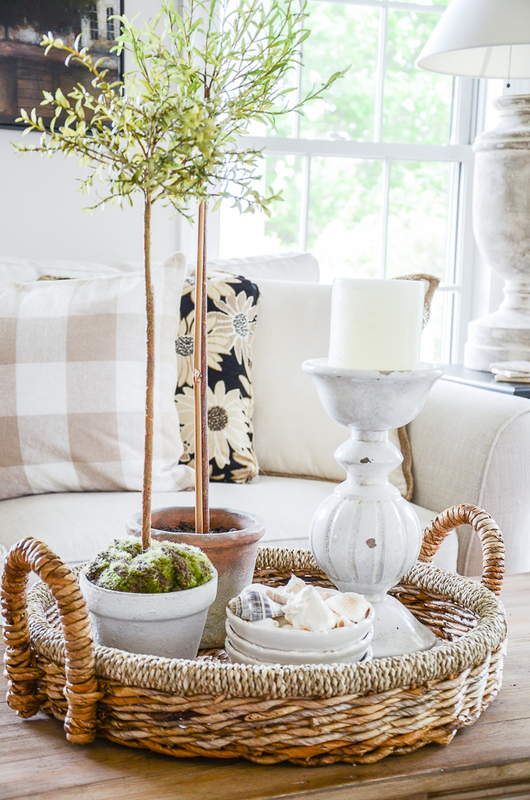 I want to stay true to the home but I struggle with decorating because there are so many things and colors, patterns and neutrals that I love! If I may ask, I am working on my dining room first and have painted an old table (until I can upgrade) a grey color with a beige undertone. the room has the white wainscoting around the bottom of the walls. As you recommend I plan on painting the walls a soft color (not grey) and dressing my old chairs in white slipcovers. But I like and feel a need for some color and pattern. Do you recommend a pattern on the curtains? I will continue to follow your blog for more great tips an ideas! I’d start with a patterned rug. Nothing too crazy. That will tell you if you should have patterned curtains or not. Leave the curtains, they look great! 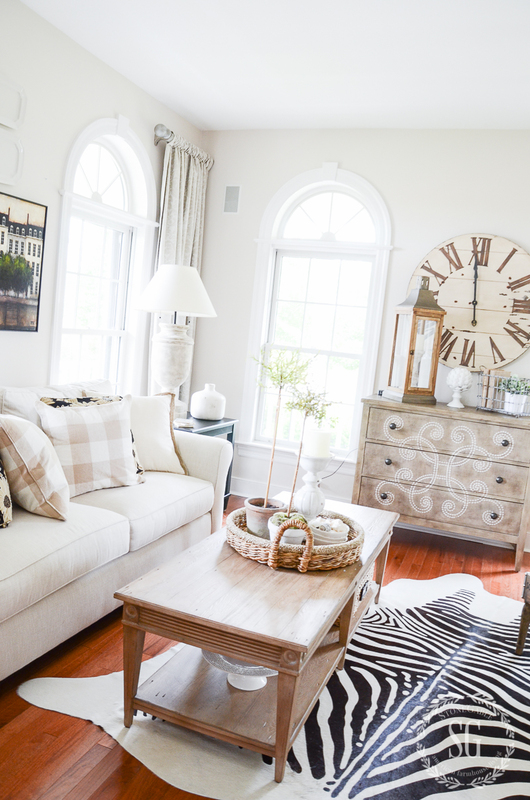 Love the look of the whole room…I recently changed out the pillows in my “classic” living room…what a difference it made! I took the pillows that came with the sofas off and went to Home Goods, and after three trips now have ten new pillows that lightened and brightened the room. I also took down very traditional curtains, replaced with textured neutral colored ones, and bought a neutral rug…whole new look to a room that had begun to feel dark…and old! Thanks for all your great ideas! These are great tips. I recently replaced a schoolhouse clock that I have had for about 30 years with a large metal clock. On the shelf below the new clock I added two orbs that I made from embroidery hoops using instructions from one of your posts. Instant update! Now if I could only bring myself to lighten up my walls! By the way, I love your curtains and think they are perfect in your home. Love your home!! You always are my inspiration, thank you. Enjoy your weekend. You have such a beautiful home. So cheerful and inviting. 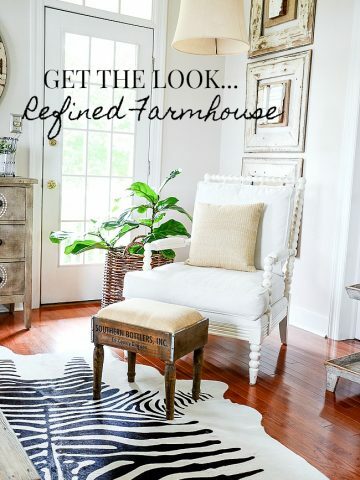 These are all great tips for an updated look! Additionally, crown molding or other decorative molding and the “right” lightning can make a huge difference in creating a classically beautiful room. I agree with you about no harsh overhead lights. Use dimmers and unique lamps. You are right Bunny! Crown Molding is on our list for the living room! Especially love how your flowered pillows work with the art on the wall behind the sofa. Thanks for the ideas! Now I am so aware of “matchy, matchy” whenever I see it!!! Being aware of this and avoiding it definitely takes decorating to another level. Blessings! Barbara, you are so right! Thanks so much for all the time, effort and encouragement you put into this blog. It gave me the courage to get rid of a china cabinet that no longer fit into our lifestyle. The young couple that was on the receiving line was as happy to receive it as I was when I first purchased it for our home over 40 years ago. The room looks so much larger, cleaner and updated. Oooooh! So glad to hear it! YOU GO GIRL! Love this room – actually love your entire home! Great ideas to add oomph to your room! I love your curtains as they are…don’t mess with a good thing! Love your curtains! I wouldn’t change them!Where did you buy them? Good morning. I love your ideas and think one item greatly compliments the next item. My suggestion on the curtains would be to use a white background material with some black in it to play off the rug. Black is just so classic and classy! Hi Ellen, I made the curtains. And put together and painted a mish-mosh of hardware to hang them.